North America boasts two types of eagles: the bald and golden. While many continents have golden eagles, the bald eagle is native to North America, with sightings in every state except Hawaii. Although these birds of prey share similar characteristics, other attributes set them apart. Juvenile bald and golden eagles can be hard to differentiate, but as they mature, a bald eagle’s head, feathers, beak and eyes will transform, as seen here with juvenile bald eagle Mko Kno (left) and his parent (right). First year golden eagles feature white tail feathers with black tips, losing the white as they age. When bald eagles are immature, a chocolate brown coloring makes them look similar to a golden eagle and helps protect as camouflage. The darker feathers allow the eaglets to blend into surroundings, but because of this, it can be difficult to tell the two apart when immature. Bald eagles become adults at four to six years of age. “The way that you can tell if they’ve reached that maturity is that full white head and white tail,” she said. Even as adults, some bald eagles can retain darker shades in their feathers, but they will have primarily white heads and tails, Randell added. Golden eagles’ beaks are also smaller and remain brown their entire lives. As bald eagles grow, their beaks turn from dark amber to a vibrant, yellow hue. Known as booted eagles, golden eagles have feathers all the way down to their feet, which adds protection during hunts. Bald eagle legs are bare, and their feathers stop several inches from their feet and feature tiny spicules to help hold onto fish and other prey. While comparable in size and weight, bald eagles occasionally have longer wingspans. “Females are going to be larger than males, but it’s the same in the golden and the bald eagles,” Randell said. Golden eagles employ strategy, often hunting together to bring down prey. Outside of visual distinctions, the two prefer living in separate environments and use two varied hunting techniques. Golden eagles do not eat fish. Their main diet includes mammals and other land animals, which is why they prefer to live along prairies and open ground. Bald eagles tend to react in the moment, but golden eagles have strong problem-solving skills. They can also pick up glove training and other exercises in almost half the time as bald eagles. Both mate for life, and if one mate perishes, the other often does not take on another. But most of the time, the pair is not together. “Six months out of the year, they are in other states or other parts of the United States, and then their built-in GPS brings them back together within two weeks of each other to nest. That’s probably how they mate for life because they spend half of the year apart,” Randell said, then laughed. Additionally, the two utilize different nesting techniques. Golden eagles often build their nests on the sides of cliffs and mountains. Bald eagles prefer trees close to water and food sources. Females from each lay two to three eggs every year, but the incubation times vary. “Bald eagle eggs are going to hatch in about 35 days or so. A golden eagle goes 40 to 45 days. So, it’s quite a big difference,” Randell said. However, they have similar parental techniques. The females and males build and take care of the nest as well as feed eaglets. “But because mom has a bigger body mass, she does most of the initial incubation,” Randell said. Since male eagles are smaller than the females, they will leave the nest to hunt for small prey while the eaglets initially develop. Once bigger, both start hunting and bringing in larger prey. While bald and golden eagles have many variances, the Potawatomi people revere them both. Eagles fly higher than any other animal on Earth, and they carry prayers to the Creator. In the 1970s and 1980s, there were no eagles across the state of Oklahoma. Today, there are more than 300 nesting pairs. 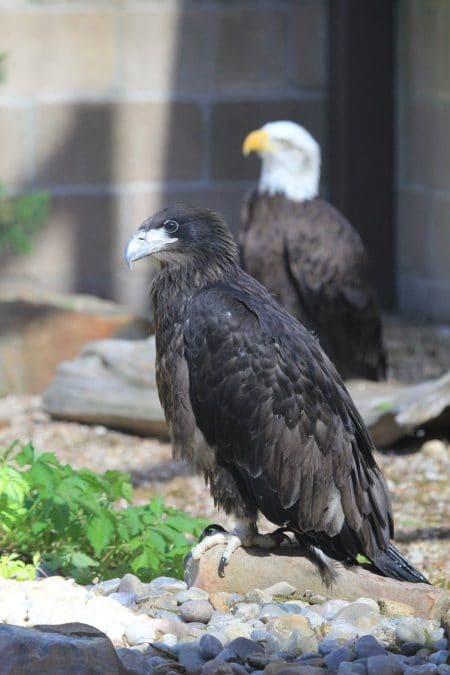 The CPN Eagle Aviary serves as a sanctuary that provides a safe, nurturing environment for injured bald and golden eagles, many of which cannot be released back into the wild. The aviary also assists with efforts across the United States to increase both species’ population, protecting these valued birds of prey for generations to come. 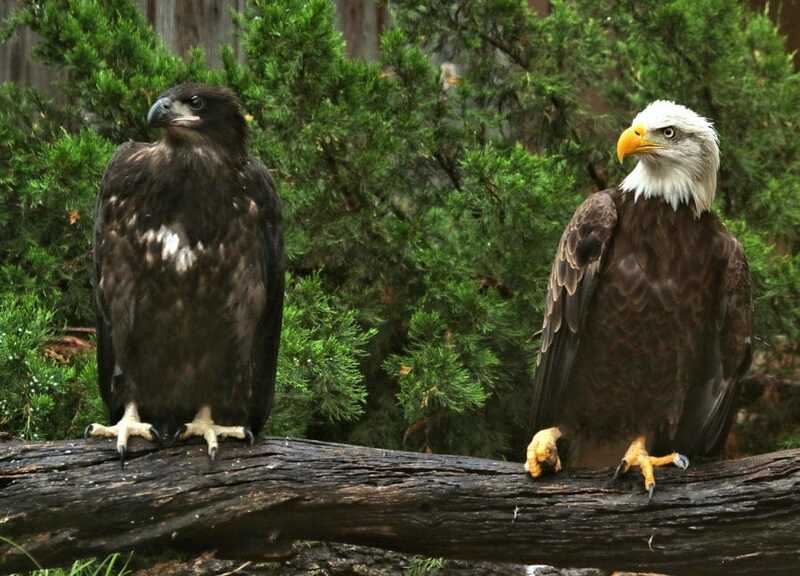 To learn more about the CPN Eagle Aviary or to schedule a tour, visit potawatomiheritage.com. 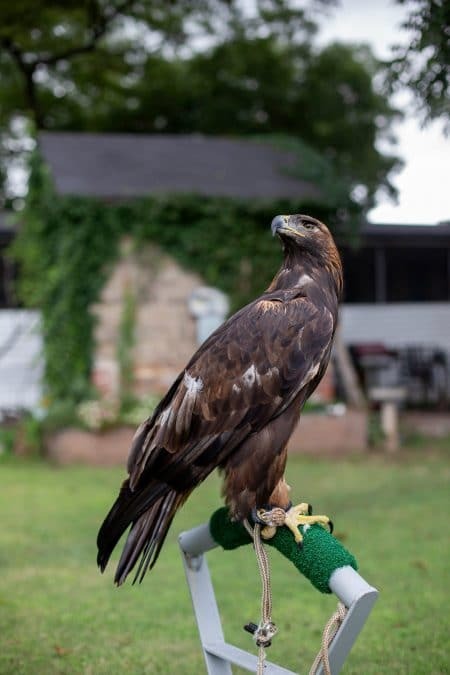 Aviary staff enjoy leading on-site demonstrations to educate the public about eagles, which are one of the Potawatomi people's most revered animals.